The political crisis in Italy that emerged after Italian President Sergio Mattarella vetoed Giuseppe Conte’s choice of finance minister quickly gave way to a compromise. But what did the affair tell us about populist politics in Italy and Europe? Ben Margulies writes that while Mattarella got his way in the end, his actions risked bringing about the very thing he was trying to prevent – an Italian exit from the euro. On 31 May, the M5S sounded a more conciliatory note, indicating that it might move Savona to a different portfolio after all. And that is what happened; Savona was moved to European affairs, and Mattarella named Conte premier. So what does this all mean? What were Italy’s leaders thinking? And what does this tell us about wider trends in European politics? Well, let’s start with that oft-repeated word, populism. A populist believes that “society [is] ultimately separated into two homogeneous and antagonistic groups, ‘the pure people’ and ‘the corrupt elite’, and … argues that politics should be an expression of the volonté general (general will) of the people.” So populists perennially enter into conflicts with elites, and those institutions that provide checks and balances between different parts of government. In Italy, this includes the office of the president, an indirectly elected head of state whose powers are more to regulate and arbitrate than to govern. It is therefore not surprising that the Lega and the M5S decided, at least initially, to confront Mattarella rather than compromise. If new elections had ensued, Mattarella would have served as the perfect metonym for an entire hated elite. His choice of an IMF official as interim premier, one associated with previous austerity programmes in Italy, only helped the populists’ cause – remember, the coalition’s programme was a deficit-financed stimulus with expanded welfare spending. 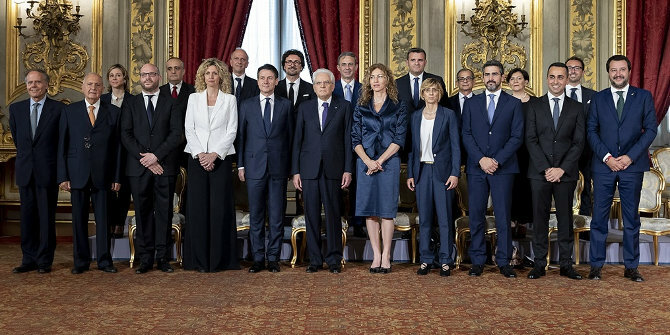 It is possible that Mattarella did not intend to capsize the new government; after all, previous premiers have accepted the presidential veto. Remember, Mattarella did not fire Conte; the premier-designate resigned. Mattarella got his way in the end. It is still worth paying attention to the reasons Mattarella cited for his decision to block the appointment of Paolo Savona. Mattarella stated that, “A representative [Savona] who … may not be seen as the promoter of a line of reasoning, often manifested, that could probably, or even inevitably, provoke Italy’s exit from the euro.” The president also cited the rising interest rates demanded for Italian public debt; losses on Italian stock markets; and concerns about the integrity of Italians’ private savings. Mattarella also claimed that the parties had not campaigned on whether to leave the euro in the preceding electoral campaign. As such, naming Savona would be undemocratic. Mattarella’s statements about Savona ignored the fact that the coalition agreement – the text binding Savona, Conte and both parties – did not talk about leaving the euro. There was talk about creating an exit mechanism in early drafts of the agreement, but those sections were removed. Mattarella was almost implying that Salvini and Di Maio had a secret plan to leave the euro – or perhaps, he interpreted their fiscal plans as being more or less the same thing. But if he was saying that coalition’s programme or attitude as a whole was unacceptable, then what he was saying is that he might not appoint a government whose policies would a) threaten Italian membership of the Eurozone and b) discomfit the financial markets. That is a somewhat shocking statement to make. One could argue that membership in the Eurozone and its fiscal rules are part of the Italian constitutional structure, but constitutions and treaties can be amended. Even more alarming was Mattarella’s suggestion that he wouldn’t name a government that led to unwelcome reactions from the market, or even contain a member that hints at radical economic policies. The irony here is that, by blocking the government formation in the name of the economic status quo, Mattarella risked overturning it entirely. He all but invited the M5S and the Lega to run on a platform of Eurozone exit if they wished, and provided the perfect environment for a classic populist campaign against a hated elite aligned with Europe. By accepting Conte, warts and all, he could have instead hoped for a quick government collapse and a centrist revival. Italian parties are not noted for their strong discipline. The M5S lost about a quarter of its parliamentary contingent in the 2013-18 parliament due to defections and expulsions. A sizable minority of the party is much more liberal than the Lega or the coalition agreement on immigration and other issues. The Lega also suffered large scale defections and expulsions earlier in its history (it lost more than a third of its parliamentary strength in the 1994-96 parliament, the first time it served in government), but its parliamentary factions have tended to be more stable in recent legislatures. In any case, the Conte government’s first test comes within the next 10 days, when it must win a vote of investiture in both houses of the Italian Parliament. The coalition has majorities in each, but watch this space. Ben Margulies is a Visiting Research Fellow at the University of Warwick.